A Differential Pressure Switch, just like a regular pressure switch, is a simple electro-mechanical device that operates on the basic principles of levers and opposite forces. Mainly, they are used for sensing a difference between two points in a process. Three key elements are used in various combinations to manufacture different kinds of differential and standard pressure switches to suit unique industrial needs. A snap-acting micro switch available in a wide variety, SPDT, DPDT, etc. pressure from two different sources is connected across a sensing diaphragm, the pressure difference creates a force which then acts upon the pre-tensioned spring. This action moves a balancing arm or mechanism to effect the minimal movement required to activate the micro switch. High and low pressures are applied on either side of the specially contoured sensing diaphragm. This feature helps to eliminate errors due to a difference in area which is commonly a problem present in twin element Differential Pressure Switches. Pressure ports for high-process pressure, as well as low-pressure are separated by an elastic diaphragm. The difference in pressure between the two ports causes axial movement, otherwise known as measuring travel, of the diaphragm against a measure range spring. The differential pressure, which is proportional to the measuring level, is transmitted through a connecting rod with little friction to the plungers of the micro switch. The micro switch contains the electrical contacts of the switch, and electrical contacts will actuate based on the switch points and set points. Overpressure is protected by contoured metal bolsters for the elastic diaphragm. The adjustment of the switch point or setpoint can be accomplished by setpoint screws accessible from the front of a Differential Pressure Switch. The graduated scales allow a relatively accurate adjustment of the switch points, and indicate the setpoint has been changed. 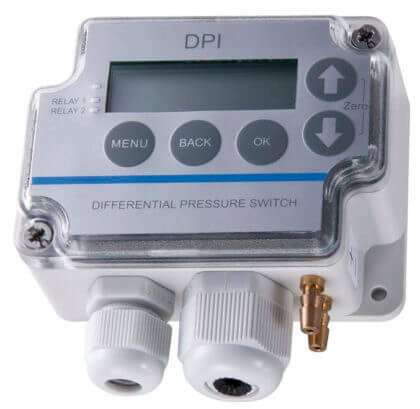 In short, Differential Pressure Switches work off the basis of a difference in pressure between two low and high points. The difference is converted to axial movement that is used to actuate the contacts of a micro switch depending on setpoints. Process pressure is sensed by a diaphragm-piston combination. Hi-side system pressure acts on the piston to product force Fh. It is counteracted by the adjustable range spring force Fs and Lo-side system pressure acting on the backside of the piston to produce force Fl . 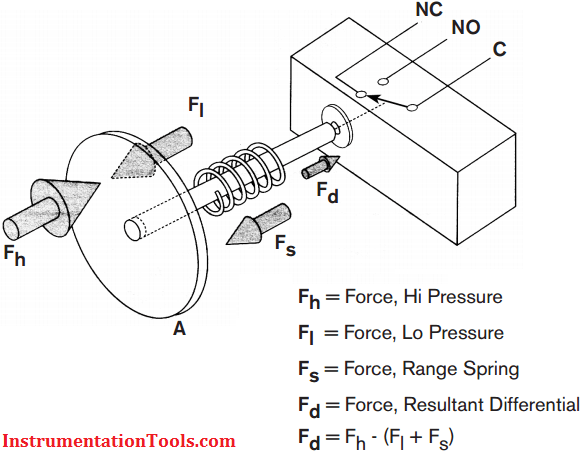 The resultant force Fd acts on the piston and overcomes the force of the adjustable range spring [Fd = Fh – (Fl + Fs)] and moves a shaft that actuates (deactuates) an electrical switching element to generate a NO or NC contact. please design engineering training at Mumbai for chemical engineers please try for me. thanks.